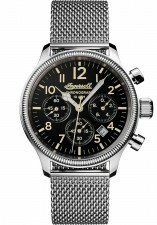 Ingersoll watches offer you timelessly classic, traditional sophistication. These iconic watches have been sold continuously for more than 125 years since the establishment of the brand in America in 1892. Today the vision of the Ingersoll brothers still forms the foundation of the brand - a commitment to meticulous design and superb craftsmanship. It is only once you have gently fastened an Ingersoll watch around your wrist and spent time studying its design, that you’ll fully appreciate the intricate detail, the exquisite watch dials and the complex beauty. Choose an Ingersoll watch that matches your lifestyle and your fashion tastes - opt for a polished leather strap or durable, sophisticated stainless steel. When you choose the Ingersoll brand, you invest in the past and the future. This page is updated daily. This page was last updated on the . All Ingersoll logos, symbols, images and trademarks are protected by copyright.